The past few years, St. Louis has become a basketball hotspot, producing NBA talent such as Brad Beal, Jayson Tatum and Patrick McCaw. The St. Louis Eagles/Brad Beal Elite AAU team has emerged as one of the best AAU programs in the country. 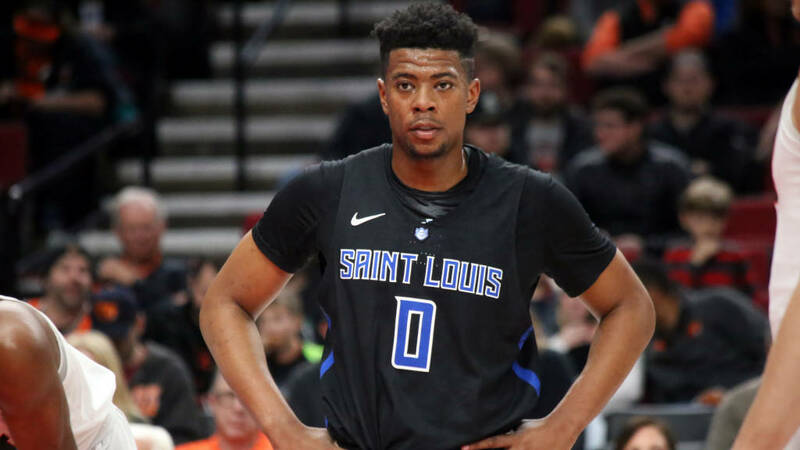 Right now, few places in the country have as much talent as the St. Louis area, and two of those players are poised to bring that momentum to the Saint Louis University Billikens. Sophomore Jordan Goodwin and freshman Carte’are Gordon were both the top player in the St. Louis area for their respective classes, and each turned down offers from several power conference schools to come play for the hometown team. Goodwin, a 6’3, 215 pound point guard from Centreville, Illinois, was one of the best freshmen in the country last season, averaging 11.5 points per game, 7.5 rebounds per game, 3.9 assists per game and 2 steals per game. He also recorded the first triple-double in school history against Duquesne. The Althoff product was Travis Ford’s first priority after Ford was hired as SLU’s coach, and considers himself blessed to be a part of this ascendant Billikens team. Gordon is a top-50 recruit out of Webster Groves(Mo.) High School who committed to SLU only a few months after Goodwin did. At the time, Gordon was ranked the 9th best recruit in the country by ESPN and chose SLU over Mizzou and Kansas. He won the U-17 World Championship with USA basketball, a Peach Jam championship with Mokan Elite, and back-to-back state championships with Webster Groves. Gordon came to SLU because he wanted to represent his hometown team and he felt they had the talent to compete with the best basketball teams in the country. “I’m from St. Louis, so it means a lot to play for my city. Also, SLU isn’t as high major as Kansas or Mizzou, but I know we’re going to have a lot of good pieces and be able to compete with those teams, and I wanted to be a part of that,” Gordon said. The Billikens are loaded with talent this year, with proven performers like Javon Bess, Tramaine Isabell and Hasahn French, and promising freshmen like Demarius Jacobs and Fred Thatch Jr. in addition to Gordon and Goodwin. College basketball pundits across the country have taken notice, with analysts such as Jon Rothstein picking SLU to finish first in the A-10. “I’m very excited for the season to come, we’ve got a lot of hype around us, the fans are amazing, with the atmosphere and the love they show the players, and it’s a beautiful city,” Goodwin said. With St. Louis developing into a basketball hotspot, playing in St. Louis offers Goodwin, Gordon and the other Billikens unique opportunities to improve their game. One example is the Pat McCaw Pro-Am, which some SLU players have been participating in. On a SLU team with 8 newcomers, Gordon and Goodwin’s local knowledge have helped teammates adjust to St. Louis. “I already showed some of my teammates the good barber shops because they were getting messed up. I had to get them right on where to go,” Gordon said. Goodwin said that even though there are a lot of new players, the team is bonding rapidly. Another big advantage of playing for the hometown team is that Goodwin and Gordon are never far from their favorite foods. Goodwin, who said Nephews’ Grille down by Busch Stadium was his favorite restaurant, is an enthusiastic fan of First Watch and Uncle Bill’s Pancake House. Gordon also has a long list of favorite restaurants. “I love Sweetie Pies, I love Nephew’s, St. Louis chinese food, Imo’s, I love all of that,” Gordon said. If SLU basketball is going to be successful now and in the future, recruiting the local area is tantamount to that success. With Gordon and Goodwin, SLU is on the path to establishing itself as the true hometown team for St. Louis. Both Goodwin and Gordon chose Saint Louis University over their respective state schools, even as both Mizzou and Illinois have tried to make the St. Louis area a recruiting priority. As Billikens, they’re representing the entire St. Louis area, on both sides of the river, the 314 and the 618. “I’m blessed to be a part of this opportunity, not only because we’re going to be good, but to be a part of something that is going to mean so much to the city, and is going to do so many good things for the city, I’m just thankful,” Gordon said.